Ready to use fruity curry sauce with pineapple & peppers. 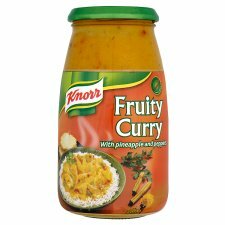 Knorr Fruity Curry is packed with red and green peppers and pineapple chunks to give you a delicious, sweet and fruity curry - you'll love it. What to do: First things first - pop on some rice - 100g (about a cup) per person. Then stir fry 450g of thinly sliced chicken strips (or pork if you prefer) with 1 tablespoon of oil in a wok for 3-5 minutes or until cooked through. Next, add your Knorr Fruity Curry sauce, stir & simmer for about 7 minutes. Before cooking, marinate some chicken in the juice and segments of an orange - add one chopped apple and a pinch of cinnamon and leave in the fridge for an hour. Remove the chicken from the marinade and stir fry. Stir in the curry sauce and towards end of cooking add oranges, apples and juice - stir and simmer for 7 minutes. Fruity!